Brain Tree wants to get back to his roots. "Bubba, I'm so glad to see you!" the young air faerie cried. Then she took a closer look. "Oh, no. You're not Bubba." Glumly, she set down the Harris and let him walk off in a stupor, wondering why he'd suddenly been swept away. The faerie wrung her hands a few moments before asking, "You haven't seen another Harris around here, have you?" It wasn't the best time to be outside. That's a good use of three years. I probably would've wasted it watching TV. I guess you could say he has foreign tastes. Mr. Quiggle enjoys his days, even with the lag. 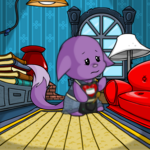 True Neopian for life!